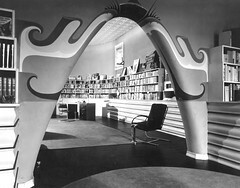 A bookstore for Lesser J. Goldman designed by Harris Armstrong. The store was located at 386 North Euclid Avenue, Saint Louis, Missouri. I've been unable to find any extant remnants of this shop.